Remember how I shared our easy Witch Kid Craft the other day, on the Glued To My Crafts? Well since every good witch needs a friendly feline to join her in her spooktacular adventures, today’s craft is just that – a Black Cat that is perfect for the Halloween season! 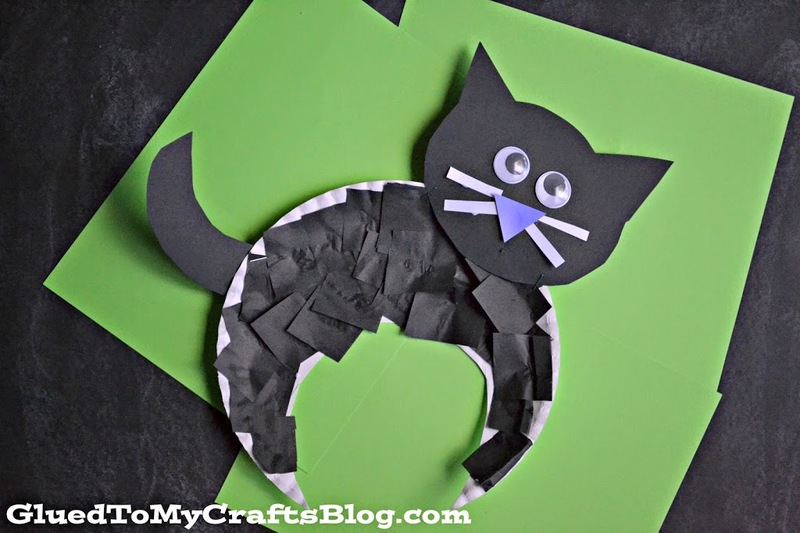 With just a large paper plate, black tissue paper and a ton of glue – you too can whip this Paper Plate Black Cat craft together with your child in no time. Sounds purrrr-rific right? I know, I know – super cheesy but I really hope this kid friendly idea inspires you! * Once you have cutout, cut up your black tissue paper into small squares. * Now cover your paper plate cutout in glue. * While your child is doing that, cut out the other cat embellishments. Think tail, head, ears, nose, whiskers etc. * To finish it all off – staple on the tail and head to the paper plate cutout. * Finally display your Paper Plate Halloween Black Cat proudly for all to see!